Abstract: Assessments of animal welfare can be complex and controversial, including where captive and free-ranging aquatic mammal welfare are of concern. An assessor's value preferences, attitudes, personal experience, and societal values are examples of factors that inform how animal welfare is evaluated. While there is not a single measure of animal welfare that is universally accepted, assessments of the welfare of aquatic mammals can be fruitful if informed by tried and true standards and indicators. Animal welfare is best viewed within context and relative to opportunities for improvement, although some animal welfare concerns may clearly be dichotomized as "good" or "bad" via animal welfare assessment tools. Tools used for assessing animal welfare can be grouped into general categories, including behavioral indicators, physiological indicators, engineering standards, and performance standards. Mellor's Five Domains Model provides a framework for integrating multiple indicators and standards; however, while there are generally agreed upon concepts of animal welfare, such as sufficient quality and quantity of food, assessors' values (belief systems) impact their perceptions of animal welfare. This can cause intractable disagreements that can be understood through Fraser's Three Orientations Model in which function-, feeling-, and natural lives-based values of animal welfare are distinguished. Still, discordance among these values can remain and can be amplified by differences in desired outcomes and how to achieve these outcomes. Tension between values confounds the resolution of tradeoffs that inevitably exist between differing animal management options such as resolution of the tension between captive individual and population-level welfare concerns for social species. 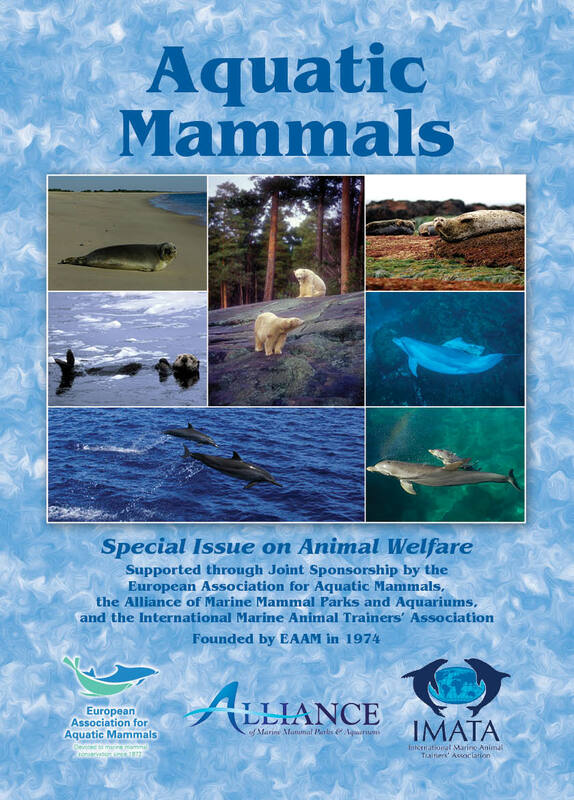 Additional contextual challenges for addressing aquatic mammal welfare include assessment of welfare in different captive settings, increased attention to the affective states of animals, and the welfare of free-ranging aquatic mammals. Resolution of aquatic mammal welfare challenges ultimately depends upon stakeholders' personal relationships and a willingness to engage in constructive dialogue. This dialogue must be focused on optimally addressing animal needs for a particular set of circumstances by using animal-based measures based on the animal's perspective rather than the advancement of a set viewpoint. Abstract: Marine mammal welfare has most frequently been a topic of discussion in reference to captive animals. However, humans have altered the marine environment in such dramatic and varied ways that the welfare of wild marine mammals is also important to consider as most current publications regarding anthropogenic impacts focus on population-level effects. While the preservation of the species is extremely important, so too are efforts to mitigate the pain and suffering of marine mammals affected by noise pollution, chemical pollution, marine debris, and ever-increasing numbers of vessels. The aim of this review is to define welfare for wild marine mammals and to discuss a number of key anthropogenic effects that are currently impacting their welfare. Abstract: The welfare of a range of terrestrial animals can now be objectively estimated thanks to the well-established, but still expanding, field of welfare science. Despite continuing difficulties regarding definitions, it is generally agreed that welfare is assessed most accurately using multiple "animal-based measures"-that is, those evaluating aspects of the animal itself such as its behaviour. In addition, scientists combining behavioural, physiological, and cognitive animal-based indicators of welfare have found this approach is superior to using one-dimensional measures. But can the same approaches be used for marine mammals, and would assessments of their welfare have the same relevance in captivity as in wild environments? There is no reason why not, and we review the past decades of marine mammal research relevant to welfare, as well as the more recent advances in the field where this topic is starting to be addressed directly. We then use the example of bottlenose dolphins (Tursiops truncatus) to examine what the measures within an all-encompassing (i.e., "comprehensive") welfare assessment might look like. Looking to the future, we suggest directions for developing assessments for captive animals and explore how protocols might differ in wild settings. In conclusion, we find that the first steps are being made towards objectively assessing marine mammal welfare in captivity-through application of terrestrial animal approaches as well as through novel paradigms. Regarding bottlenose dolphins, several welfare measures have been proposed and should now be further validated and applied. It is hoped that this review will encourage continued research in marine mammal welfare assessment given the demonstrated initial achievements of bottlenose dolphin welfare studies and the potential for application to many different captive and wild contexts. Abstract: The objective assessment of animal welfare is important for building consensus among people concerned with animals and for advancing our understanding of animals in our care. The analysis of physiological stress response using glucocorticoids is one of the major approaches for animal welfare assessment. Recently, cortisol accumulated in hair or other keratinous materials of animals has been considered as an indicator of the long-term activation of the hypothalamus-pituitary-adrenal (HPA) axis. Particularly, there is evidence that hair cortisol (HC) can be used as a measure of the long-term activation of the HPA axis in various mammals. This review discusses the utility and limitations of HC analysis for welfare assessment, mainly based on findings from captive chimpanzees living in a sanctuary in Japan. First, the methodological and physiological perspectives of how to to obtain reliable results from HC analysis will be discussed; and second, the potential of using HC analysis for welfare assessment will be reviewed. A series of studies on captive chimpanzees show that HC is useful for monitoring the effects of social management on the long-term stress levels in captive chimpanzees. Although further studies are needed to clarify the extent to which HC monitoring can help us understand and improve animal welfare, application of HC analysis might be useful in investigating similar issues in marine mammals. (1) the bottlenose dolphin (Tursiops truncatus) and (2) the Antillean manatee (Trichechus manatus manatus). The results of the practical application of the evaluation are described in this article.